Rare Bird Books, a Vireo Book, 9781945572470, 322pp. Eric McCanus is a novelist with the misfortune of having written his one great book when he was young. Struggling to write more, recently divorced, while still missing his ex-wife, Eric becomes convinced that happy relationships are unsustainable. Determined to prove the accuracy of his theory, Eric stumbles upon a seemingly perfect couple at the market. Convinced the marriage of Cara and Matt can't be as successful as it appears, Eric does what he can to break them apart. What follows is a psychological and philosophical comedy of errors. 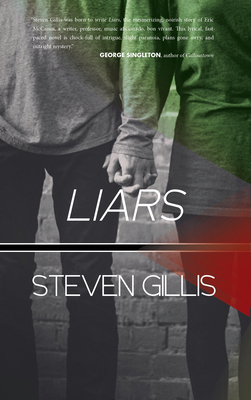 Liars is an exploration of love, relationships, and human interaction, a madcap romp through the vestiges of modern affairs, revolving around five characters, each spun drunk on the batterings of love while attempting to sustain themselves in a false world. Steven Gillis is the author of five novels and two short story collections. A founding member of the Ann Arbor Book Festival Board of Directors, and a finalist for the 2007 Ann Arbor News Citizen of the Year, Steven taught writing at Eastern Michigan University. In 2004 Steven founded 826Michigan, a mentoring program for students. In 2006 Steven co-founded Dzanc Books. Steve lives in Ann Arbor with his wife Mary, and two dogs, and regular visits from their kids, Anna and Zach. Steven can be contacted at steve@dzancbooks.org and barkingman@aol.com.